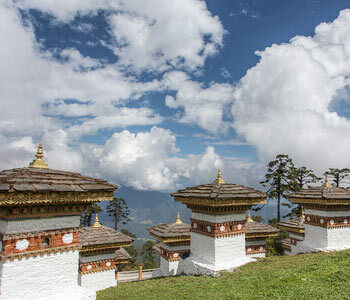 Weather conditions in Bhutan vary from one place to the other depending on its elevation. The extremely rugged terrain of this country is divided into 3 regions marked by their altitudes and the climatic conditions of all 3 regions vary. The first is the Himalayan region in the North that consists of mountains and peaks, where the climatic conditions are extremely cold winters and cool summers. The second is the central uplands on the slopes and valleys of the Himalayas, where it�s cool in winters and hot in summers. The third is the plains where they experience a tropical climate. Thimphu, the capital of Bhutan is at 200 meters above sea level in the west. Central region and the temperature range from 15 degree C to 26 degree C (approx), and the winter season is from December to February. The monsoon is heavy in Bhutan, which is like most of the South Asian countries, but the western region gets the brunt of 60% to 90% of the regions total rainfall. The areas in higher altitude receive heavy snow during the winter season.